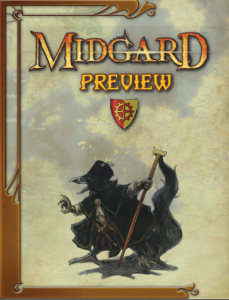 The kobolds have cooked up a free preview of the Midgard Campaign Setting, and you can download it now in the Kobold Store. Traits and Bloodlines and Jeff Grubb fiction? What more could you ask for, except one of those snazzy hats that huginn is sporting? Downloaded it yesterday, read half of it, will read the rest this weekend. Short review of the half I’ve read: Jeff Grubb’s story was fun and made me want to throw that monster at the party. Really liked the art (lay out is excellent) and really want to take a closer look at that map of the wastes. General info on the different parts of Midgard was very nice and helpful for a little something I am working on. Jeff! I want you to know I really enjoyed your fiction. It’s the kind of thing I like to read and like to write! Hope we can meet again at next year’s PaizoCon.